Meet the 2018-2019 SANDCASP Board! The San Diego County Association of School Psychologists supports local school psychologists to take a whole-child approach to education as they assist teachers, administrators, students, and support staff to meet the intellectual, social, behavioral, and emotional needs of each and every child in the county. We welcome the help of school psychologists, students and university staff. Volunteers can help support events, serve on committees, attend board meetings, and more! 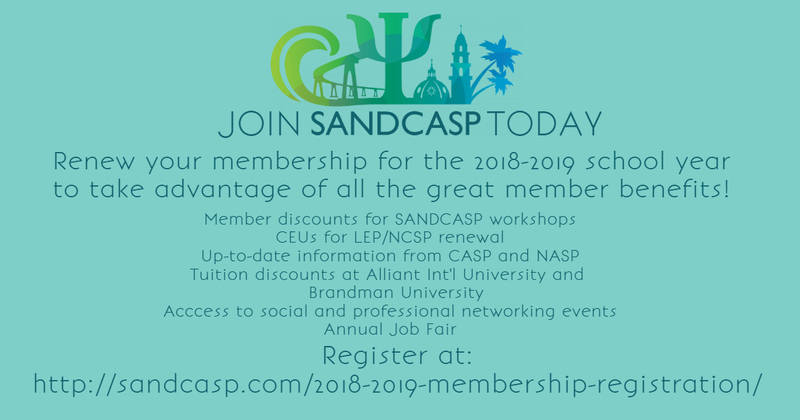 For questions, concerns, or more information on membership please email us at board@sandcasp.com.